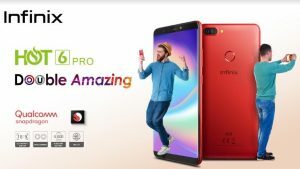 its new smartphone HOT 6 Pro in an exclusive deal. no less than the rear ones. A 5M 4-in-1 camera is all what it takes to have a perfect selfie. Talking about the features of HOT 6 Pro, one needs to revise is the concepts of aesthetics and beauty altogether. night and protect eyes from getting dry and painful. homes. Saving cost and reducing effort, the right time for buying all new HOT 6 Pro is now! devices are designed specifically for young people who want to stand out, reach out and in sync with the world.